The morning proved mostly frustrating. I’d met up with Andy again at Oakenclough on a forecast of an 8 mph easterly wind that would drop during the morning until by 3pm it would be no more than 5 mph. Another Fake Forecast from the Brussels Broadcasting Corporation! From a very cool and steady 10 mph the wind actually increased to something like a bitterly cold 20 mph. For a while we sat in the car with the heater at full blast and the heated seats switched to “on” just to keep warm as the nets produced nothing. I tell a lie, a single Lesser Redpoll was all we had to show for our labours and the 0630 start. We’ll save our efforts for another day soon. There came recompense in the form of yet more news of the Lesser Redpolls we ring here at Oakenclough . A juvenile male number S800767 ringed here during autumn migration time on 26 September 2017 was later recaptured by other ringers. 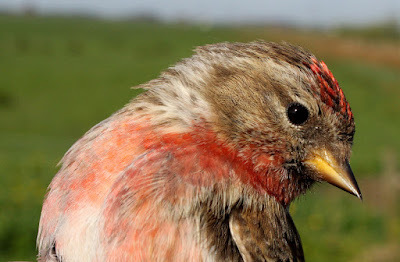 The redpoll, by now an adult male, was caught again on 25 March 2019 at a garden centre near Kingswinford, West Midlands. 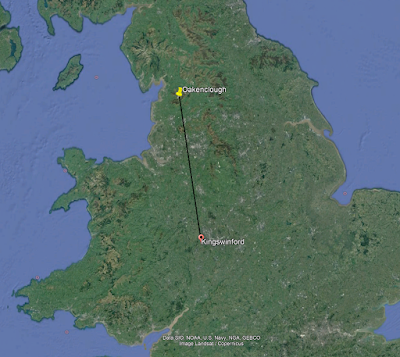 Almost certainly it was migrating north, the likely destination Scotland, our Oakenclough site a stop-over. S800767 probably spent the winters of both 2017/2018 and 2018/2019 many miles south of the West Midlands, perhaps near the south coast of England, or in a region of France or Belgium. 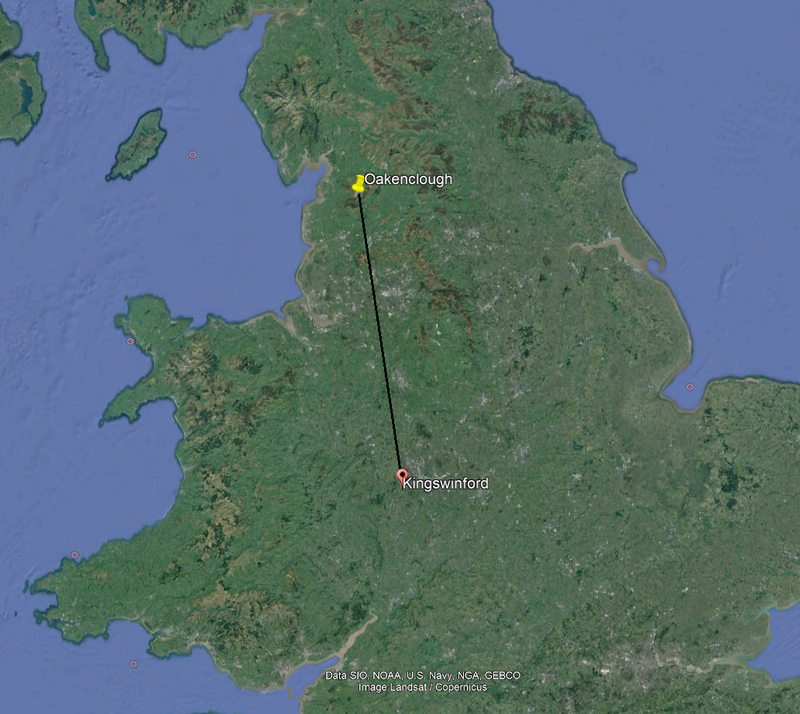 Because we finished early this morning I took a detour home via Garstang, Cockerham and then Pilling. Although pretty bare vegetation wise the now enhanced Condor Green was stuffed full of Oystercatchers and to a lesser extent Redshanks, both looking for territory in which to breed. I counted 58 Oystercatchers, 18 Redshanks and 2 Avocets, many already paired up, and from the Oystercatchers more than a few “piping parties”. There have been a number of Avocets passing through here recently but as far as I have seen none yet on territory – not a bad thing for a bird whose eye-catching looks belie an aggressive nature. There were still 8 Teal, 2 pairs of Tufted Duck, 3 pairs of Shelduck, 10 Greylag and a pair of Canada Goose. At our ringing site for Sand Martins at Cockerham I counted 60+ martins around last year's holes but it is far too early to disturb them; best for now to let the birds settle in and repair/excavate their new homes for 2019. At Braides Farm - a lone Wheatear, 40+ Golden Plover in the grassy field and the pair of Pied Wagtails around the buildings where a Starling examined a nesting cavity. At Lane Ends Pilling I noted 4 Little Egret, the resident Little Grebes, a party of 5 Wheatears close together on the marsh. In the trees, song from 2 Chiffchaff and a single Willow Warbler. At Damside a pair of Kestrels is in residence, and seen from the gateway, another Wheatear along the fence line that heads to the marsh. The weather next week suggests more moderate to strong easterlies, not the best wind direction to help returning migrants or one that might help our ringing. But as ever our focus will be on the weather forecasts to find those windows of opportunity for birds, birders and ringers alike. 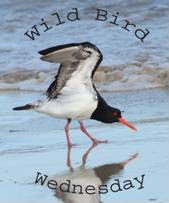 Linking this post to World Bird Wednesday and Anni's Texas Birding. 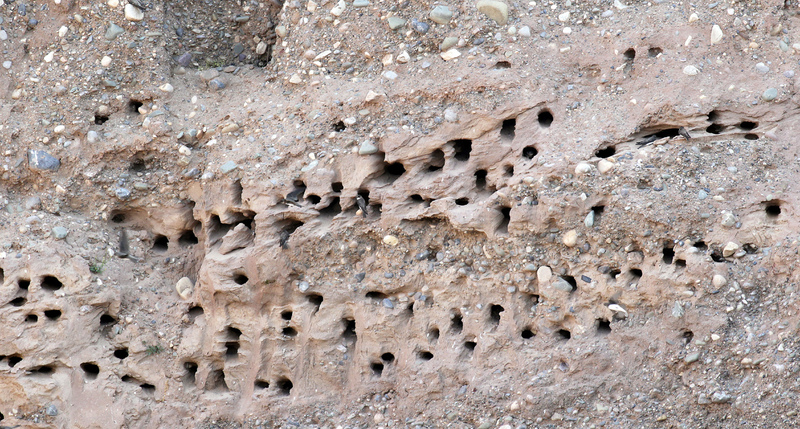 Enjoyed seeing the sand martin colony. 60+ martins is amazing. 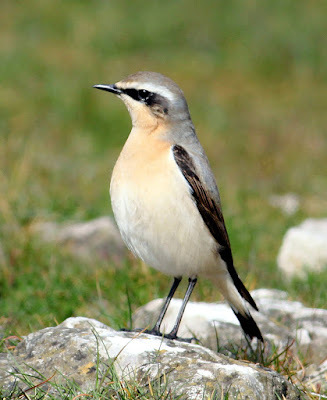 The wheatear and pied wagtail are pretty birds. Have a wonderful Sunday. avocet looks unique: beak and combination of colors. Too bad for the nasty weather. For the past three seasons I know just what that is like. But, my goodness, you sighted a lot on the way home!! I hope your next effort with Andy will be more successful. For all your sharing, I and we at I'd Rather B Birdin' send our thanks!! Most interesting that well-traveled redpoll. What an interesting life birds lead; it’s so good to find out more about that through your work ... and generous information sharing. Sorry it was still so cold on this ringing day ... ha, our weather reporters too have been known for fake news for a long time (since before the horrible orange creature made it a household phrase). Oh too I didn’t understand about the avocets... did you mean you don’t want them to stay on your patch? I’m always so happy to see them, but haven’t researched their habits (Sadly, i know that won’t surprise you coming from this mostly accidental birder). It's hard to stay out in the bitterly cold winds. We are already getting high temps that keep us inside...or on shorter hikes. Love some of the unusual names of these birds! Beautiful photos! I'd have a hard time dealing with that freezing cold wind but I do love the beautiful birds you shared. Hello, beautiful variety of birds. Some of my favorites are the Redpoll, Avocet and the Pied Wagtail. Beautiful photos. Happy Monday, enjoy your day! Wishing you a happy new week! Loved the photo of the Avocet. Lovely shots of the birds! Glorious capture of the Avocet ! Oh, very beautiful bird pictures. I can learn form u a lot. 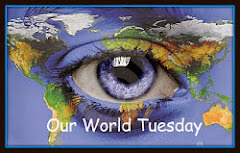 You have consistently excellent posts - great photos and highly informative. Such sweet little birds ! Such a lovely variety of birds here, so lovely to see the sand martins colony too. Beautiful birds! Your shots are great!